The Holliston Newcomers Club will organize and arrange a meal to be delivered to new parents. Please let me know if you or another club member is expecting! We are happy to do this and will be respectful of time and meal preferences, special diets and food allergies. Please feel free to contact me by email with any questions. Thank you and we're delighted to have you as a part of our community! We hope everyone had a wonderful Thanksgiving! And with the help of Holliston Newcomer volunteers and our local businesses and community members, many deserving families who would not have otherwise did as well. The Holliston Historical Society Barn was bustling with activity on the Saturday before Thanksgiving as our member volunteers and their families assembled over 160 Thanksgiving Baskets for the Holliston Food Pantry and other local organizations. It was so satisfying to see our community come together to make this project such a success. We had so many generous donations from our local businesses and community members, which helped to purchase all the produce and gift cards. Food drives were held by almost every organization in town - so much so that they collected almost all of the non-perishable items that we needed! And between the Girl Scouts at our food drive, HKHO (Holliston Kids Helping Others) making over 150 cards, and the Holliston High School Hockey Team helping with assembly, our job was made so much easier. We couldn’t be more thankful for the support we received from the community on this project. We are so proud that the HNC had a part in making Thanksgiving such a great day for so many of our neighbors. We have had such a huge outpouring of support for this project from the community, and we feel so grateful to live in such a wonderful town! So many groups have already committed to helping out by collecting the needed non-perishable items, making cards to be included in the baskets, or signing up to volunteer at our food drive at Shaw’s Ashland. And the donations have already starting rolling in! 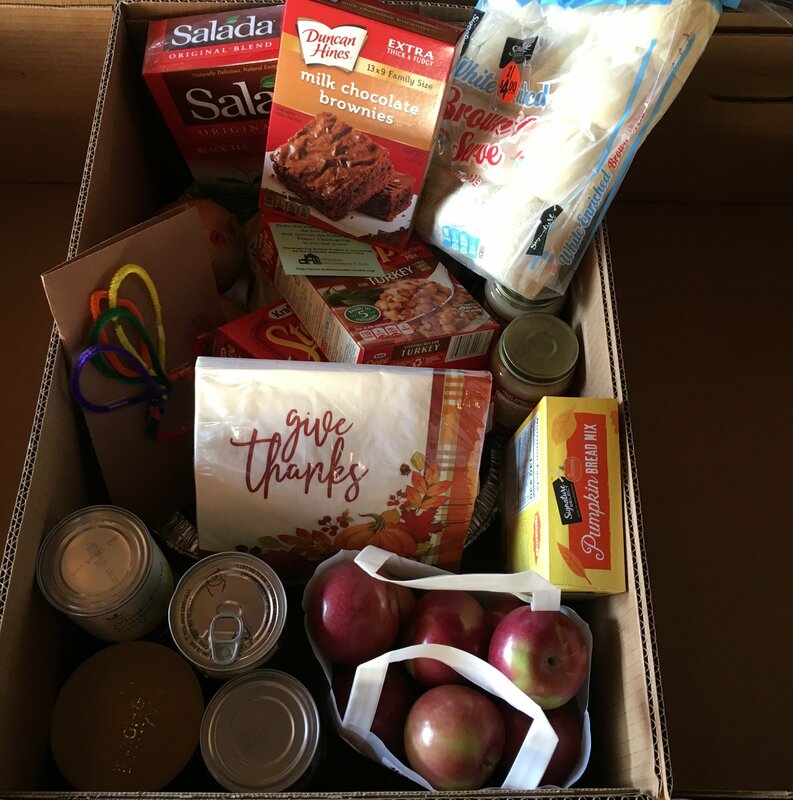 Every year there are local families who struggle to put a meal on the table at Thanksgiving. With your generous support this Thanksgiving we hope to provide a complete holiday dinner for over 150 Holliston area families. Your help is critical to reaching this goal! Donate funds online or mail your donation to Katrine Giroux, 147 Mohawk Path, Holliston. We rely on donated funds to purchase produce, turkeys, and other basket items. Volunteer at our Food Drive on Saturday, November 3, 9am-4pm at Shaw's Ashland. Sign up here. Volunteer at the Basket Assembly on Saturday, November 17, 9am-12pm at the Holliston Historical Society Barn. Sign-up here. Note that we are in need of another truck to pick up produce on the morning of assembly at Shaw’s Ashland and deliver to the Holliston Historical Barn. Time commitment is 730 am -830 am. 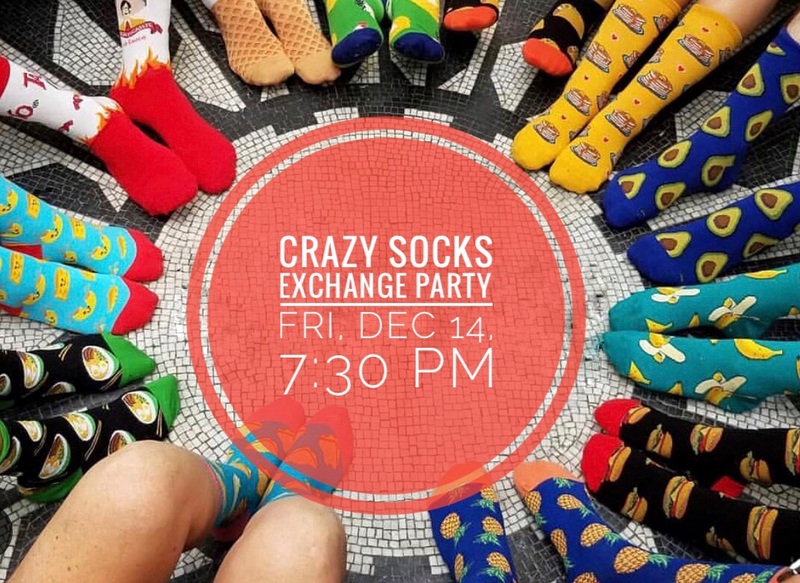 The Ladies Escapes group is happy to announce its very last event of the year, a Crazy Socks Exchange Party. We decided to put a fun twist on the highly popular ornament exchange and came up with the Crazy Socks Exchange. Each person will bring a pair of new, crazy, funny socks filled with small goodies and receive a pair from someone else. The price limit is $20. Pizza and drinks will be provided, and please feel free to bring a dessert to share. The party will be at Timea's house on Friday, December 14 starting at 7:30 pm. Her address will be provided upon RSVP, so please do not forget to RSVP to Timea at timusch@yahoo.com! We are pleased to announce our Gingerbread House decorating event is back for another year! Tickets include gingerbread houses and all the candy you can fit on them! Cost is $40 per house, and multiple people can work on one house. Seatings are available at 10am – 11am; 11:30am- 12:30pm ; and 1pm – 2pm. Can’t attend but still want to contribute? There is also an option to purchase a house for a food-pantry family to decorate. And remember that 100 percent of the money raised from this event helps to fund our grants. We will also be sending out a sign-up for volunteers to assist the day of, so please be on the lookout for that soon.